My fiance and I just moved into a two bed, two bath condo and basically have nothing in terms of home items. We have a wedding registry at a couple of the typical stores (Crate and Barrel, Macy’s, etc.) and I would like your advice on how to build an Uncluttered Wedding Registry. There are a lot of items “they” at the stores suggest for a registry that are true unitaskers (e.g. salad spinners). What items would you definitely put on your wedding registry and what items would you definitely leave off? Kirsten, this is a HUGE topic, so I want to just look at the subtopic of the kitchen right now. You’ve said that you don’t have a lot of home items, which makes setting up a registry a good plan for you. I would keep two things in mind when heading to the stores: 1. The employees at the store want you to have people buy, Buy, BUY!! gifts and don’t care a whole lot about helping you get your home in order, and 2. Your goal is to set up your kitchen in the way that you and your spouse will use it. Simply put, if you don’t eat salads or a lot of vegetables, the salad spinner the sales rep at the store is promoting probably isn’t for you. 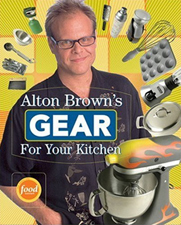 To help you decide the items that you should put on your list, I recommend getting your hands on a copy of Alton Brown’s book Gear For Your Kitchen. You can go through the book, learn about the items he reviews, and make decisions as to if they’re good matches for your kitchen. I recommend Alton Brown because he has a hatred for unitaskers, similar to ours. Speaking of unitaskers, you also might benefit from reading this article from the Chow blog called “Common appliances, uncommon uses.” It’s a great piece to get you thinking about ways to be creative with the appliances you have in your kitchen. Oh, how I love when unitaskers can become multi-taskers! I feel much better about owning my ice cream maker after reading this article. Good luck, Kirsten! Keep us posted on how the registry turns out for you. Also, I know that Kirsten would love to hear additional ideas about a kitchen registry in the comments — so please offer up your advice in the comments section. – Start your registry with items you consider essential – you can always add more later, but if you want, say, at least 6 place settings of formal china, hold off on listing the serving bowl. – Depending on your guest list, people may or may not prefer to buy you “real” gifts rather than just giving you money. Remember you can always return items for store credit, so if people are really attacking your registry, make sure there are enough options that you don’t end up with unreturnable boutique gifts by default. Of course – if the guests are of the type that will frequently be in your home, only return things that no one would notice (register for extra specialty pots and pans, bedding/pillows… that could easily turn into more china or furniture or whatever). I couldn’t agree more with this! In fact, I’m getting married in two weeks, and the first thing I did before we registered months ago was read that book cover to cover! 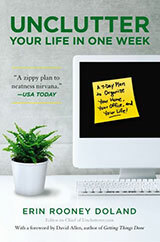 We are huge AB fans, and I consider his book essential when you’re trying to figure out which appliances and gadgets you really need. It’s like you’re reading my mind, Erin! To add to the previous comment, think about the things you’ll actually use regularly. We aren’t big entertainers, and I know that when we do have to entertain, it’ll probably be kids from my youth group. Therefore, we didn’t bother registering for silver or china because it’ll just take up space in storage we could be using for something else. We also registered for offbeat things that we really wanted: Deluxe Scrabble, a digital camera, and luggage (all of which have been bought while we haven’t received a single towel!) And yes, we have received a lot of cash from distant relatives especially and even some gift cards, so add things right before the wedding so that you can get that discount, as sneaky as that might sound! Best of luck! Bittman’s cookbook “How to Cook Everything” is also a fine addition to any kitchen and worthy of inclusion on your registry. It’s a great, non-fussy basic cookbook. One thing I would warn you about is what I think of as “aspirational items,” things that play into a Martha Stewart-esque fantasy – if I had x I would certainly do y all the time and it would be great! I’ve got a slow cooker from two years ago still sitting around on the off chance that I’m (1) conscious enough to cook in the mornings and (2) have any ability to know when I’ll be home on a given evening (I’m a graduate student). Once I’m done with classes and have settled into a thesis lab, it’s likely to get a good amount of use, but at the moment it’s just something I have to store. Frame your registry items in terms of how much you cook now, not how much you wish you cooked. And if you cook at all and don’t have a sturdy stand mixer like a Kitchen-Aid, register for one. It is one of the few “aspirational” kitchen purchases I can recommend to any cook, as it really does make things so much easier that I find myself baking much more now that I own one. Don’t buy sets. One of the most common mistakes folks make in setting up a kitchen is buying sets of knifes, pots, pans, etc. You will find yourself reaching for that one good, six or nine inch handmade, Japanese chef’s knife and the one good steel to keep it sharpened than you will for all the other various knives in most sets. Equally important, that good knife will be one you buy once, will last a lifetime, helps the guy who made it instead of the company which manufactured it, takes up less space, produces much less clutter, costs the earth fewer resources, and can often cost less than the set. Add in a good, fold up Mandolin from a restaurant supply, and you can forgo the cost and clutter of a food processor. The same could be said for buying good, copper sauce pans–there are still affordable ones in antique stores–over that set of Calphalon non-stick. In terms of pans, you need an omelet/crepe pan–the only pan which needs a non-stick coating, a couple of cast iron frying pans, a good a 1 & 3 quart pot, and and a stainless steel or restaurant supply soup pot. The case iron will go from the stove to the oven, is inexpensive, will distribute and maintain heat better than almost anything else, and if you learn some basics about how to take care of case iron, you’ll pass it down to your grandchildren. In fact, that’s where ours came from. Calphalon makes a good omelet pan, and you can often pick them up on sale. Your sauce pots should be copper with a tin lining, which can be put back on–again keeping a craft and craftsperson alive. Ours is from the 19th century. Like case iron, if taken care of, copper will last generations. It gains and looses heat quickly, and don’t tend to have hotspots, things which you’ll learn to appreciate and find worth the investment if you continue to cook. In fact, these kind of long lasting cooking tools have a tendency to hang around in a family, because mother or Uncle Tom didn’t learn how to use them, but they belonged to Grandmother X. You might ask for one of the family piece’s of cast iron or that soup pot your father used to cook up that Gumbo. After all, that “something old” can connect you to the heritage which surrounds your new (and old) family’s traditions of cooking, and it’s a good way to make both new and old connections with family. If you learn how to use these pieces, you can keep your kitchen minimalistic while keeping quality tools in the family and in use. Just imagine teaching your children to cook in the same pots used by generations of family. You get the idea. The single greatest gift folks can give you is a couple of cooking classes. Don’t worry about the exotic, and the ones at continuing education are often better than the ones at the kitchen stores, which wants to sell you stuff. Look for classes focused on technique instead of recipes, and you’ll be on the money. Learning good technique allows you to forgo all the odds and ends a kitchen store will try to sell you. Instead, you’ll learn how to use a solid set of tools well. Until you learn the basics of cooking and figure out you and your new husband’s relationship with food and cooking, you don’t need the various “necessities,” gadgets, and single task wonders folks will get you at the likes of Macy’s. If you go this route, I suspect you’ll find yourself getting rid of most of what you’re given in only a few years. Finally, cooking is given to flirtations with novelty and flash almost as much as is the fashion world, but there are traditions and techniques and tools which have remained staples of different cultures for centuries. Look for these in which ever cultural tradition you want to cook in, and you can’t go too far wrong. Just be careful. The single most versatile and uncluttering pot you can buy is a steel wok sans wooded handles. You can stir fry, fry, boil, and steam in the same wok, but a wok often ends up in the clutter under the counter because folks in the US don’t have clue as to how to season and use it, and we don’t have stoves which are designed for use the shape efficiently. I’m also a grad student, and I use my slow-cooker a whole lot. First, I prepare things the night before, then in the morning I just take everything from the fridge, throw it in the slow cooker, and flip the switch. Nothing to really do in the morning. Second, I bought a timer for it (for about $12 or so), so that it’ll just cook for the number of hours required, then stay warm until I do finally get home. Ditto everyone else on registering based on how much you THINK you will cook, but on how much you actually DO cook. If you don’t have a lot of kitchen stuff now, you probably don’t cook that much. Which is fine, but it means that walking into a store and trying to guess what you need is an exercise in inviting clutter into your home. Learn to cook first, and THEN add to your kitchen as you learn what you need/will use. If you don’t cook, you will NEVER use that cast-iron fry pan everyone told you that you needed. Ditto for everything else. You don’t need more than two sets of sheets (but it’s probably worth registering for NICE ones). The number of towels you need depends on how convenient it is to do laundry. Etc, etc. So before registering, consider spending a couple of weeks just writing down every time you said, “I wish I had a coffeemaker/microwave/ice cream scoop/whatever.” If you found yourself wishing you had it more than once, it’s probably a good thing to register for. If you didn’t once think you needed it, it’s just going to take up space in your house. Don’t get me wrong, I love Alton. I have episodes on DVD. However, I have to take issue with his being against unitaskers. He had an episode about hot chocolate, and he owns a special mexican hot chocolate mixer! Don’t register for something you already have just because you want a new one. I registered for brand new pots and pans because I thought the ones I had–they were 30 year old red Club pans handed down from my mom–were ugly. But they were sturdy and thick, and the same pot could cook green beans or deep fry chicken. My shiny new pots aren’t that versatile. I miss my ugly old ones. Allow yourself to be picky about what you choose, no matter how minuscule it is. For example, I didn’t put much thought into the spatulas and measuring cups I picked because they were only spatulas and measuring cups. I just picked the most popular brand, which happens to be clunky and rubbery. Now I hate them. I use them almost every day, but they’re in good shape and I can’t justify replacing them yet. I’d also recommend against the collapsible measuring cups. They look like a great space-saver, but one of mine just split along one of the folds, after only about a year. I got these ones after one of my previous set of plastic ones melted in the dishwasher. My advice would be to stick with metal for that sort of stuff. I am cracking up at this post because just a few days ago my 4.5 year old daughter pointed to a still wrapped box in the space above our kitchen cabinets and said, “What is that?” I told her it was wine glasses from our wedding (8 years ago). She was baffled and I have to admit, now I am, too. I HATE wine glasses. Well, more to the point, I hate WASHING wine glasses. When we have wine I just drink it out of little glasses like they do in Italy. I have a cupboard full of wine glasses that never get used. Seems ripe for decluttering!!! Don’t hesitate to register for “smaller” items — sometimes people enjoy making up a set of less expensive, related gifts. This can net you dish towels, pot holders, cooking utensils, and other essential kitchen items that you’ll use every day. As for what NOT to request, my best advice is: If you wouldn’t buy something for yourself (money permitting), don’t register for it. Our two “why did we ask for this and where will we store it?” gifts are dinner-party items where I fell prey to the magic of the wedding registry but never would have encountered such a desperate need that some other dish wouldn’t substitute in the unlikely event they were needed. And on a related note, I *totally* agree with the people who say to assess your current lifestyle before making the registry. if you don’t entertain as a couple now, you’re unlikely to start just because you’re married. Ditto for major cooking/baking. When we first went to register, I had a magical picture in my head of convivial dinner parties with friends served off our newly-registered-for items. Until the first time my fiance asked “when would we use that?” and I said “when we throw a dinner party.” There was a pause while the idea of us hosting a party sunk in, and then we both laughed so hard we cried. As a bit of a side note.. a salad spinner doesn’t have to be a unitasker. I use mine to help dry other vegetables when making stir fry or anything else that I don’t want to spatter. At the risk of running contrary to the site’s mission, I have to admit sometimes, it’s great to have more than one of an item. Specifically, about a year ago my husband and I realized that every time we tried to reach for the pancake flipper, it was dirty and in the sink/dishwasher. We bought two more of the exact same type. Now we always have one clean, ready to use and don’t have to stop mid-cooking to wash one. In our case, three of one item is a time-saver, not clutter. So, if there is one item in your current kitchen that you find you use multiple times a day, consider if 2 would be even better, or just clutter. One the other hand, ditto foregoing knife “sets” for one knife you love. You’ll want to go to the store and hold several different styles in your hand. But when you find the right one, you just *know* – it feels like an extension of your own hand. @Ann – I can’t tell you how many times I wished we owned a second pancake flipper! I feel validated after reading your comment! After 20 plus years of loving to cook with my husband, we are surprised at how little kitchen equipment we actually own. It has been well worth it to invest in fewer high quality pieces – we started with Calphalon but upgraded to All-Clad stainless when we decided to stop cooking with aluminum. We bought a small set of quality knives, a Cuisanart food processor and a Kitchen Aid mixer. We’ve owned them for years and still enjoy using them every day. On a side side note, I use my salad spinner to spin wool socks and other small items that I hand wash. Unitasker indeed! I wanted to support buying a salad spinner too – it makes me much more willing to actually make salad, which is good, and as a couple of people have said, you can use it for other veggies. I’ve also used ours to transport big salads to potlucks (it’s one of the type that has an outside bowl that’s waterproof, and that makes a nice, light bowl in a pinch). I also would disagree with the “don’t upgrade what you have” theory – DO consider upgrading what you have, but only if you don’t LIKE the ones you have, and after researching carefully to find better versions. We had a crappy toaster oven that dried out our toast, so I checked Consumer Reports online and we ordered a better one; ditto with a blender – and we’ve used both of them a lot, and been much happier with the new ones. But, yeah, if something ain’t broke, don’t replace it. My other piece of advice is to consider registering through Amazon (possibly as well as someplace else, especially if you do want china, flatware or linens, or other stuff you’ll want to see before choosing): they have a really broad selection, since they represent so many smaller vendors. Set up your own wedding website rather than go through Wedding channel–we had trouble linking to anything other than their sponsoring (more pricey) stores, and it was frustrating. Banquet sized tablecloth that needs ironing each time we use it. Pilsner glasses. They are perfect for beer, iced tea and ice water. These get the most use at my house. 9×13 pan with cover- STILL haven’t gotten one! 8×8 brownie pan: ARRGH! WANT! Kitchen Aide mixer and heaviest-grade blender I could get my mitts on: worth every inch of space. My husband adores the food processor, but to me, it’s just a lot of parts to wash instead of a knife or grater. Small cast-iron frying pan: I work in health, and there’s a lot of lab results about teflon that creep me out. We keep the iron pan on the stove top all the time, and use it so much that it never gets dusty. And hey- extra iron in our diet! Stemmed Cake plate: Makes even my saddest baking effort look special! A few cheap stacking trays from Ikea that will fit in my fridge: great for pre-arranging trays for parties and just whipping them out when the previous offering gets demolished. For flatware, we chose one of Oneida’s “Lifetime Patterns” and did the same thing. They supposedly never go out of production. Now when half the teaspoons mysteriously disappear, I only have to order a few more and voila! a full set of flatware remains. Think hard before registering for both china and everyday dishes. Most people never use the china. Ask around to family and friends if they could loan their china if needed. Renting place settings is also an option. 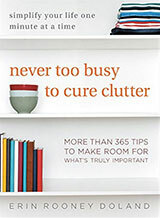 Thanks for all of the great advice Erin and Unclutter readers! I’ll check back in to let you know how it goes. I think you don’t even need any non-stick pans at all. I use cast-iron frying pans and skillets for everything I do, including fried eggs, fried rice, tomato sauces, pancakes, and grilled sandwiches. Other than that, I keep three saucepots: one small, one bigger, and one that was restaurant surplus and heats really nicely for white sauces. One big stockpot for home canning jams, preserves, and pickles. And some baking tins. I do keep a crepe pan. I bought it as a birthday present for myself a couple of years ago and I love it, even though I don’t use it frequently. It’s a fun treat for me and my daughter when we do bring it out. It’s not non-stick, though. Generally I think food browns and caramelizes better when you don’t use non-stick pans. I don’t know if that’s scientific or anecdotal. One item I haven’t seen mentioned here that I have found a lot of use for in the last year is: an immersion blender. You can use it to make sauces and smoothies (my kids use it to make milkshakes) and it has greatly expanded my soup repertoire Sp?). I used to refuse to make those soups that required one to “puree in batches” no matter how good they were. That was just too much work! Now I can just stick the blender into the soup and voila!the leeks and potatoes (or whatever) are smooth. The blades can be washed in the dishwasher. I’d only register for things you will really use. Some of the sillier items I’d registered for are never used. I second Bet on the immersion blender / hand blender. I use mine all the time for smoothies, soups and sauces. It is super easy to clean and store. I even gave away my regular blender on Freecycle! The other kitchen item I adore is a sturdy grater. The IKEA Griller one is perfect because it has a rounded base and holds the grated food until you’re ready for it to come out. A few years ago I was in desperate need of new dishes. My now fiance, then just a good friend, taunted me unmercifully about my getting the clear blue glass set of dishes from Wal-Mart. His rational was that if it cost $6.00 for 4 place setting its cant be that good. Since then every single time we have company people comment on our fancy plates. AND they are amazingly easy to clean and completely replaceable. I disagree about not registering for things you won’t use. Wait! Hear me out before thinking I’m absolutely crazy. Pick a store that you expect to want stuff later. For example, Sur La Table if you’re in the process of learning to cook. Or Target, or Barnes & Noble; whatever fits you. Register for things you want. Now register for things you might want or things that others probably would want to get you (even if you don’t want them). After the thank you notes and the wedding, return the items you don’t want. If the item was ordered through the gift registry, the store will (probably will?) include a gift receipt showing it was ordered thru the registry. Now you’ll have a stack of gift cards to a store you want to shop at. This won’t work for people who don’t like social lies or who can’t stand regifting. To my mind, though, it sure beats having a dozen useless cluttery items from Tiffany’s because your registry was sold out and some of your guests didn’t know what else to get. Kristen, my wedding is Saturday. Trust me, “they” suggest a lot of really odd things. Use your gut instinct. The registry folk still have china and crystal down as something you “should” be registering for, so I’m not sure how much you can trust them. I stuck to things I knew my fiancee and I would use. I bake and my husband-to-be grew up in the kitchen of his family’s restaurant, so we stocked our registries with things we’d be sure to use often. Never underestimate a good set of quality wooden spoons, metal measuring cups/spoons, cast-iron kitchen gear…and a good apron. 1) Definitely say no to knife sets. We have a large and medium version of both Santoku and Chef knives (that’s four large knives) and three different paring knives. I’d really just rather have the large Santoku and the smallest paring knife, but I don’t know what to do with the others. 2) Some duplicates are a-okay, however. I cook a LOT, but we don’t go through enough of our dishwasher-safe items quickly to make sure everything is clean and, frankly, it’s my husband’s job to wash the dishes… I have three sets of the Chefmate silicone scrapers from Target. They cost just over $2 a set and last a very long time. I also have a red silicone scraper from the Martha Stewart line at Macy’s that is a wonder. I love that it doesn’t stain. I have lots of wooden spoons and several whisks, as well. I definitely don’t consider them clutter because they are contained in one small area and get a lot of use. 4) If you are uncertain if you’ll want multiples of a particular item (eg, do you really like those towels? are you worried they might fall apart/shrink/whatever), TRY before you buy (or at least before you render them unreturnable). My husband and I did not live together before we were married and didn’t know that we were not going to tolerate sharing bedding (we each have our own down comforter with duvet now). I registered for three sets of high thread-count sheet sets and VERY stupidly washed them all and put them in the linen closet. I was then stuck trying to figure out what to do with three King-size flat sheets (quilt backing, incidentally). I wish I would have only opened one of the packages so that I could have returned the other two.